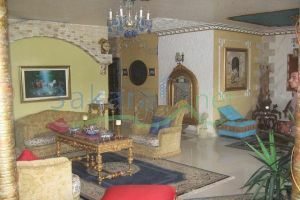 Hand made decoration, 300 msq, 40 msq Terrace, 4 bedrooms, 2 living rooms, 1 dining room, 6 bathrooms, 2 maid rooms with their own bathroom, artistic decoration like you have never seen before, all handmade, with a ver nice view to the mountains. In the most quite and secured area in Hazmieh. 4 parking spots, 6th floor.